Monday was the first of five vacation days I was taking. I had no real plans, but Melissa was formulating a few. She had just finished checking the Web site of the inn we haunted a couple summers back. They don’t do much business during the week in the winter. Yeah, there were vacancies. Just like there were last week when I checked. There was no reason not to go. No blizzards in the forecast … smaller winter weekday crowds … the chance to try out the snowshoes I bought last winter and never got around to using. We were packed and on the road in three hours. By nightfall we were moving into a condo for three nights at Yosemite West, a private development down the road from Badger Pass ski area at Yosemite National Park. I got in a couple of excellent hikes and many excellent pictures, and she got a couple days of kicking back and letting somebody else attend to the domestic drudgery. Tuesday morning dawned cold and clear. 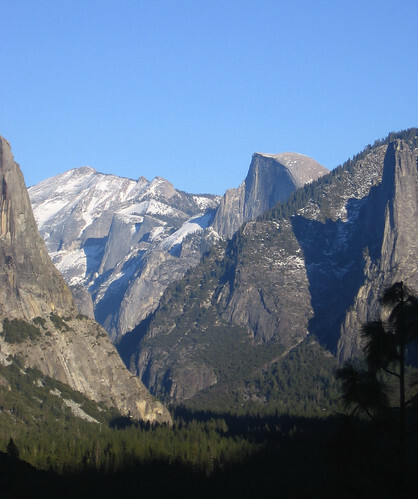 I left the condo early, hoping to catch the first rays of the sun illuminating the Yosemite Valley canyon walls. 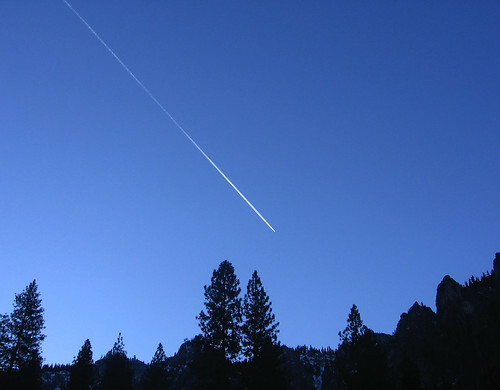 One of the first things I saw was this vapor trail from passing travelers missing all the fun down here on terra firma. 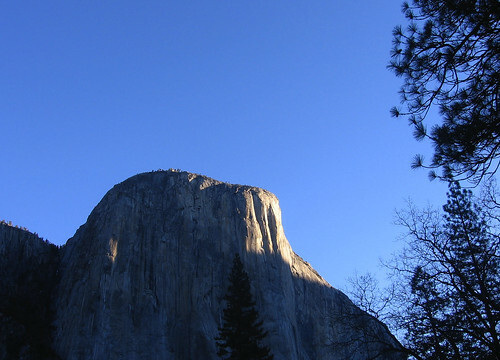 I got down to the valley floor just in time to capture the sun lighting up the face of El Capitan. 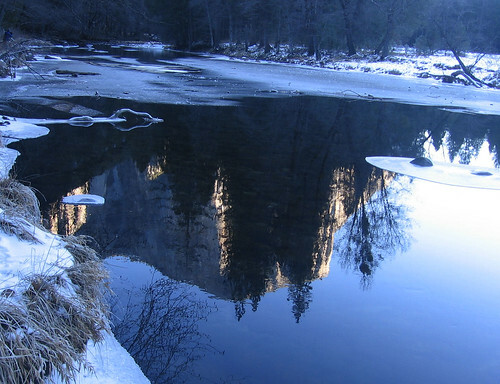 I also did a couple laps around the valley, stopping along the Merced River to see if any cool reflections showed up. 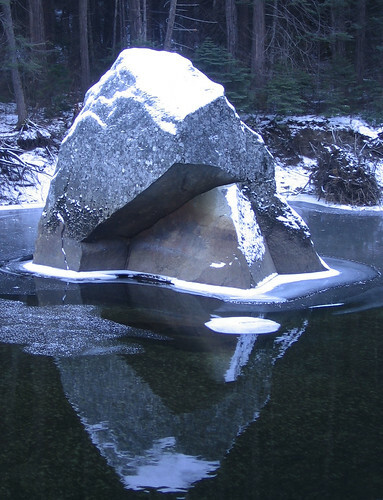 This rock sticking up out of the river is excellent photographic fodder, especially with a frothy cap of snow. A small flow at Lower Yosemite Falls. 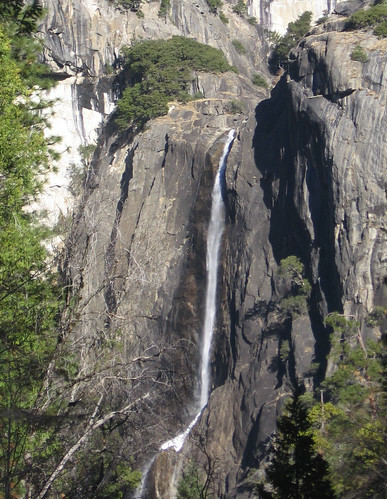 This scene prodded me to check out the Upper Falls Trail, which goes to the valley rim some 3000 feet above. I made it just a bit more than half way; it’s a long, long way up there. 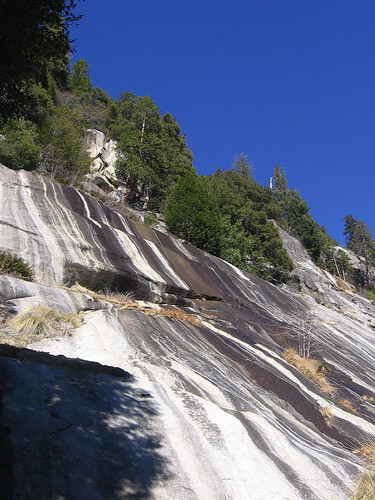 The granite walls are spectacular; the trail is rocky but well maintained. 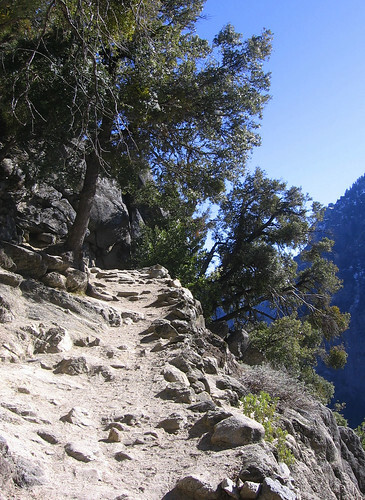 A more or less representative shot of the Yosemite Falls Trail. 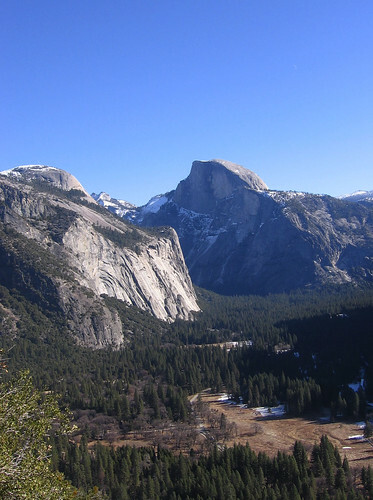 Yosemite Valley, from the Falls Trail. Melting snow leaves striped stains on the rock face. 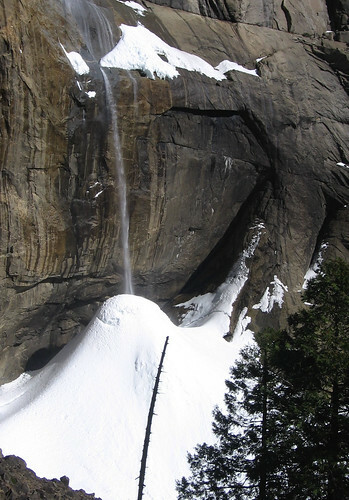 There she is: Upper Yosemite Falls. Spray from the falls lands on a huge ice cone. 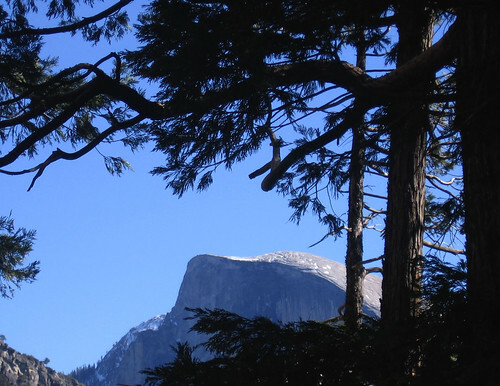 Half Dome across the valley. 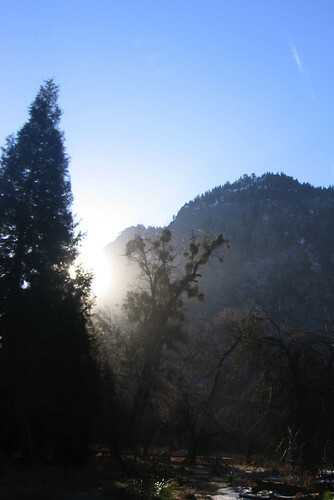 Canyons have much shorter days of sunshine. 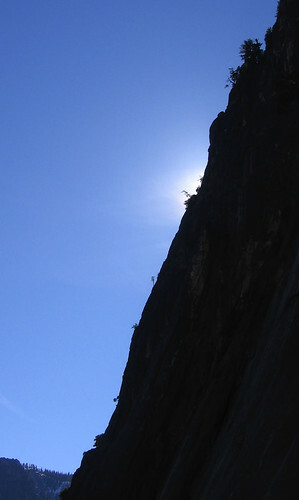 Here’ it’s 3 in the afternoon and the sun’s already disappearing behind rock faces. 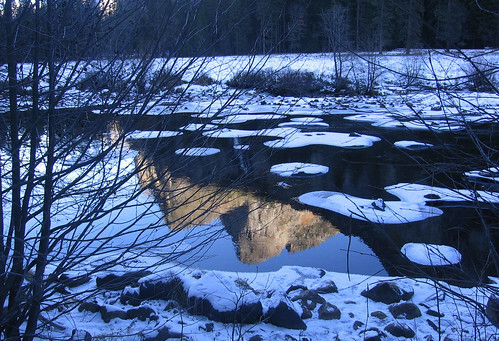 The other side of the valley reflects in a pool of the Merced River in late afternoon. 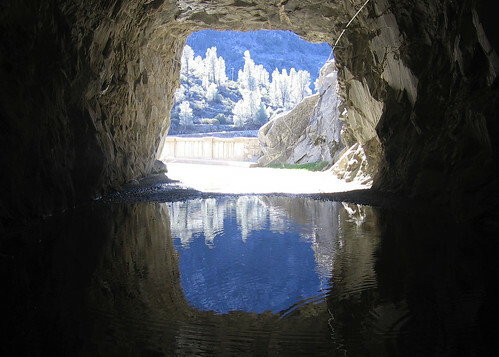 The valley, from Tunnel View. 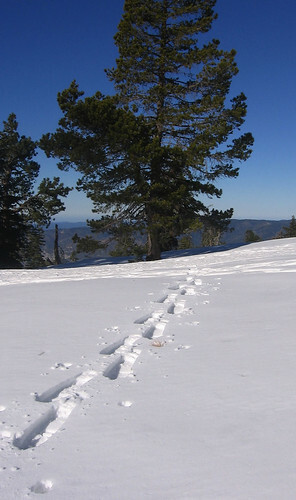 Snowshoes are too heavy, too noisy, too messy, too clumsy. They ruin every patch of pristine snowfall. 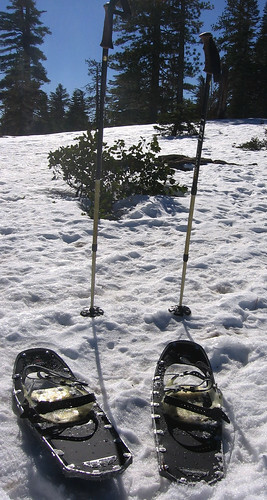 A mile in snowshoes is like three miles in regular shoes. Pity the cross-country skier who tries to make a go of a moonscape snowshoe trail. There is nothing remotely pleasant about trying to travel with oblong webbed contraptions strapped to one’s lower extremities. But they do provide one pleasure that balances out the pain: the ability to stomp through hip-deep snow without sinking to your hips. 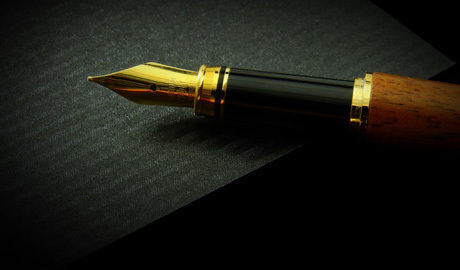 It just feels like getting away with a crime or something. Snow does strange things to the trunks of trees. 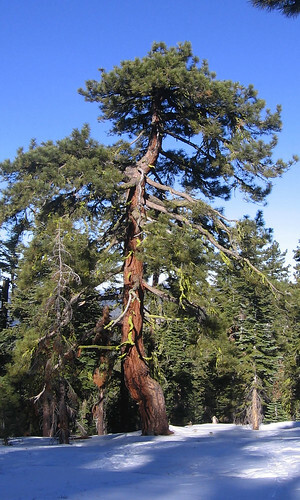 This is one along the Ridge Trail to Dewey Point. 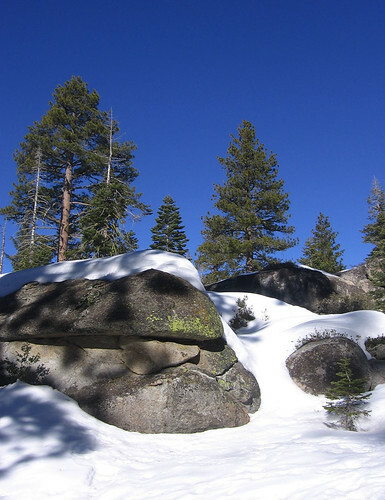 The trail’s hardly worth a mention in summer, but in winter it’s fairly challenging. All the stuff my camera likes: Sky, trees, rocks, snow. Poles and shoes at Dewey Point. One of many spectacular views from Dewey Point. 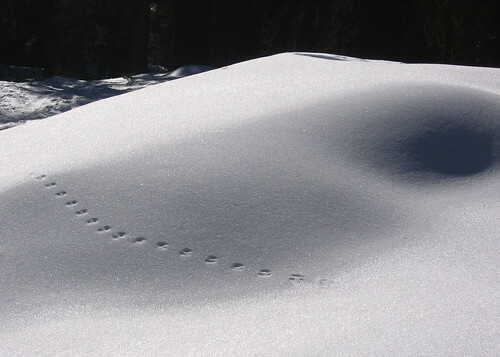 I returned via the Meadow Trail, where I saw evidence of a critter scampering across the snow. 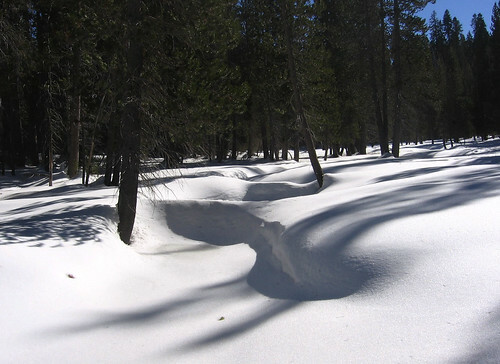 Snow drifts create excellent shadows. 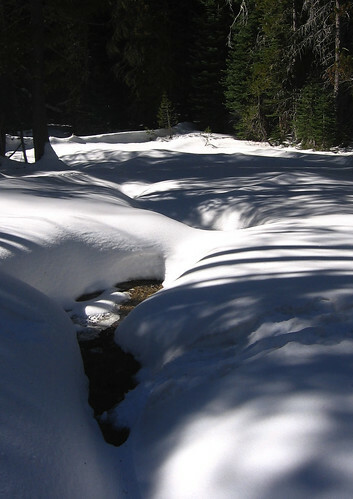 A creek wends its way across Summit Meadow. On Thursday morning, we checked out of the condo and headed homeward. 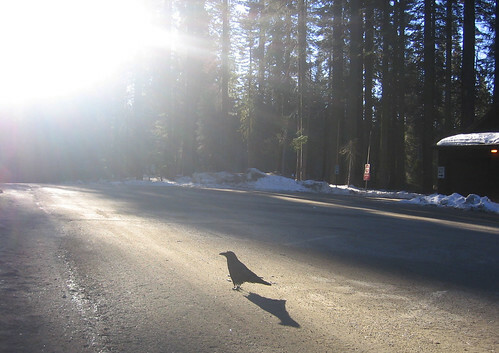 Quoth the Raven: “I’m ready for my close-up, Mr. DeMille.” Melissa took this picture at the Crane Flat gas station, whose proprietors had neglectfully hiked the price of a gallon of petrol by only 50 cents more than the going rate 30 miles beyond the park’s borders. In summer the sticker shock is far worse. 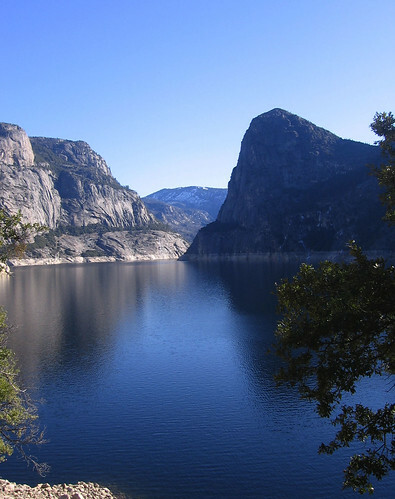 We stopped along the way at the Hetch Hetchy reservoir, which holds most of San Francisco’s drinking water. You have to see it to believe it. 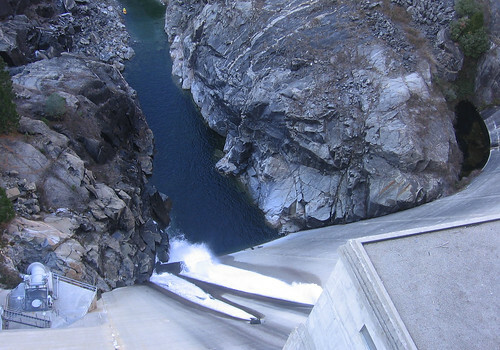 Here’s the dam holding back the waters of the Hetch Hetchy Reservoir. Think of this: A hundred years ago somebody came to this same spot and said “a dam would really dress up this neighborhood.” Humanity is utterly undeserving of such a fine planet. Now some folks think the dam oughta be torn down and the valley “restored” to its original condition. If only. All I can think is that the only thing worse than putting the dam in would be to take it back out. 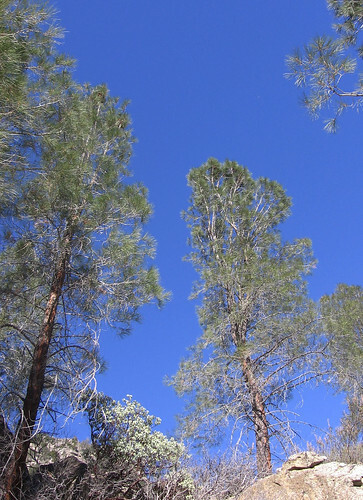 Some nice trees on the steep cliffs around the reservoir. See, there is light at the end of the tunnel. Does this quote sum up the modern outdoor experience or what? As a fly fisher, three hours is fast yet as a human being, it’s laughably slow. What do we take on trips to the ourdoors that requires three hours to packs? I have no idea. I just know it fills the car. My computer refuses to load the third day’s pix, Tom, but I love the the other days’. 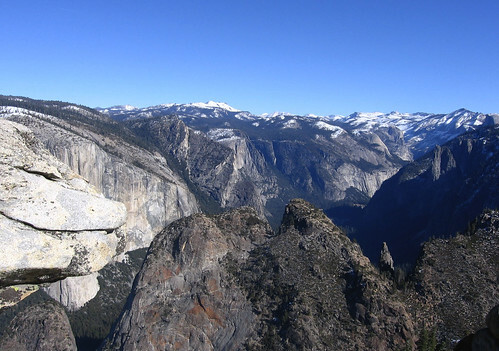 I’ve been to Yosemite only once, last May, when the water was the highest in years. Here, you caught the winter light on the mostly bare rocks well. You did a nice job with the reflections in the still water, too. According to the internet movie database, that quote is actually “All right, Mr. DeMille, I’m ready for my close-up.” Uh, but that would be nit-picking!